PETALING JAYA: Mah Sing Group Bhd plans to use its cash pile of RM150mil as at Dec 31, 2008 to acquire new land locally and in other regional markets to realise its vision as a regional property player. President and group chief executive Datuk Seri Leong Hoy Kum said the company was in a good position to make some opportunistic acquisitions to lock in land which had dropped in value following the global financial meltdown. “In any challenging environment, there are always opportunities to be tapped and with land prices at more reasonable entry levels, our strong balance sheet will enable us to expand our presence and ensure healthy earnings growth,” Leong told StarBiz. While moving ahead with its plans to become a regional player, he said the company would be prudent in its cashflow management and not over-commit. “We will weigh all the risks and returns before venturing overseas. We shall be very careful in evaluating any business expansion to ensure we have good investments that will allow the company to chart good growth,” he said. Mah Sing hopes to finalise its first overseas deal this year and to launch its maiden offshore project next year. The markets being targeted include Vietnam, China, India and Indonesia. Locally, the company recently purchased 2.12ha of freehold land in Setapak and 26.8ha in Sri Pulai Perdana 2 in Johor Baru. In addition to these acquisitions, it has 11 projects in the Klang Valley, four in Johor Baru and one in Penang. The company’s remaining landbank of 231.6ha has an estimated RM3.9bil in remaining gross development value and unbilled sales which will sustain earnings growth for the next five to seven years. Despite the gloomy market outlook, Leong said Mah Sing’s quick turnaround business model, focusing on niche medium to high-end landed developments, had generated healthy profits and cashflow. “As we have pre-constructed some of our properties in certain key projects which are locked in at the old construction costs, we are able to continue launching the projects,” he said. Mah Sing’s exposure in the three growth corridors of the Klang Valley, Johor Baru and Penang, coupled with a healthy mix of residential and commercial projects, would ensure good growth sustainability for the company, he said. On the commercial property front, he said prospects for Grade A office space in the Golden Triangle were still good, thanks to the limited supply and strong occupancy rates of above 95%. “This bodes well for our Grade A office, The Icon Jalan Tun Razak which will be completed by June. Southgate in Jalan Sungei Besi has also done very well, achieving RM150mil in sales since last March,” Leong said. Property developer Mulpha International Bhd, which has slowed down its capital expenditure, is reducing overheads and battening down the hatches to weather the current economic storm. "While we are monitoring the market closely and conscious of our capital expenditure, we are confident of the quality of our developments and assets and have a strong balance sheet to ride out the current economic storm," its executive chairman Lee Seng Huang told Business Times in an interview. He believes that there is still considerable wealth on the sidelines, citing recent sales of properties at its developments in Australia which saw buyers making purchases without the need for any financing. Lee said that Australia would continue to be the most profitable market for Mulpha, contributing some 70 per cent to the group's revenue and net profit. Mulpha, which has invested A$1.2 billion (RM2.8 billion) in Australia, owns properties worth several billion ringgit. They include the Sanctuary Cove; Hyatt Regency Sanctuary Cove; InterContinental Sydney; Hilton Melbourne Airport; Norwest Business Park Sydney; The Hotel School Sydney; Bimbadgen Estate in New South Wales' Hunter Valley; and Hayman Great Barrier Reef. Lee said it had been difficult for Mulpha to find sufficient assets of scale at the right price on the domestic front. In the nine months to September 30 2008, Mulpha posted net profit of RM14.3 million on revenue of RM741.6 million. On another note, Lee said that Mulpha might sell assets for higher returns and reinvest the capital. Mulpha has been conscious of its gearing levels. In the last two years, it has sold the Novotel in Sydney, Sheraton in Brisbane and Sydney Opera House Carpark. It has a portfolio of hotels and residential, commercial and industrial properties under its stable in Malaysia, Singapore, Vietnam, Hong Kong and mainland China, as well as Australia. Its assets in Malaysia are worth RM1.5 billion, the largest being the Leisure Farm resort project in Iskandar Malaysia in Johor. While its investments in Singapore, Hong Kong and mainland China are still small, Mulpha also owns the fully-tenanted Indochine Park Tower in Ho Chi Minh City, Vietnam, where its investments are being maximised by renting out any vacant units at higher rates. "In terms of asset disposals, we have always maintained that if we can get higher returns by selling and reinvesting capital we will, but we are not selling for the sake of selling. There are no plans yet to sell," Lee said. "Our assets have a low-cost base and we have not revalued them upwards on our balance sheet. But any sale we make will have good margins. Investors are cautious now and we cannot predict when they will be more willing to buy," he added. Mulpha may also consider restructuring or recapitalising real estate investment trusts (REITs) that are under performing in the market. "Since most REITs are trading substantially below their true worth, they are good target acquisitions now. It would be cheaper to buy REITs instead of an underlying collection of assets," Lee said. PETALING JAYA: Mulpha International Bhd will forge ahead with plans to develop its property projects in anticipation of better demand once the economy and, in turn, the property market picks up again. Executive chairman Lee Seng Huang said the group would focus on its Leisure Farm Resort in Iskandar Malaysia, Johor as well as its high-end boutique development in Bangsar and an office tower in Jalan Sultan Ismail, both in Kuala Lumpur, to enhance its property portfolio. “We are very confident of the quality of our unique developments and have a strong balance sheet to ride out this storm. “However, we remain conscious of our capital expenditure and are tailoring our project timing according to the rapidly changing market environment,” he told StarBiz. Lee said there were a further 600 acres to be developed at the RM2.1bil Leisure Farm Resort – a gated resort development that covers about 1,765 acres surrounded by rivers, orchards, parks and a mangrove swamp. An upcoming development there include spa villas and chalet hotels along the canal. Two villas will be ready soon at the new show village which will ultimately feature six villas. 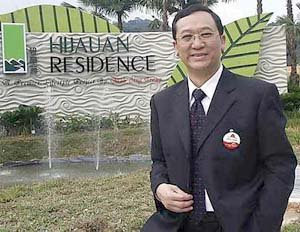 “The pricing of about RM3mil per unit at the Polo Precinct will set new benchmarks,” Lee said. In addition, the Bayou Water Village, comprising 213 stratified canal front village homes, will be completed by the fourth quarter. “When the market shows signs of improvement, we may launch our new Precinct 7 consisting of lifestyle landed semi-detached units and bungalows fronting the canal and mangrove reserve. “The development will have 332 units with a gross development value (GDV) of RM500mil. Precinct 7 will be our key focus in the fourth quarter as we gear up towards earthworks in the next quarter,” he said. Mulpha will also expand Bale’ Equestrian & Country Club’s support facilities to include a full suite of conference facilities, indoor multi-purpose sports complex, tennis courts and lap pool. Lee said the group’s proposed seven strata bungalows with a green architectural concept called the “Enclave” with a GDV of RM70mil in Bangsar were scheduled to commence work in the second half of the year. “The project is very niche so there should be sufficient demand to ensure its success,” he added. On the 28-storey commercial office block in Jalan Sultan Ismail, Lee said Mulpha had obtained the development order for the 360,000 sq ft office tower, which has a GDV of RM450mil. “In view of the shortage of prime A+ buildings in the city centre, we are proceeding with the building plan submission for construction,” he said. PETALING JAYA: Singapore’s residential property investment sales were down 81% to S$6.3 billion last year compared to S$32.7 billion in 2007 as developers turned cautious due to poor response to new property launches. AmFraser Securities Pte Ltd analyst Lau Wei Chong said in a report Tuesday that one indication for the drastic drop in investment sales was the sharp decline in enbloc transactions. He said there were seven deals last year compared to 111 in 2007. “Developers were reluctant to commit in view of poor responses to new property launches, a more stringent credit approval process and higher costs of building,” Lau said. Due to scarcity of land, developers on the island-state often buy older properties on an enbloc basis and then redevelop it. Singapore, which slipped into recession in the third quarter of 2008 (3Q), saw private home prices fall by 6.1% in 4Q as demand for new housing slipped. This followed a 2.4% decline in 3Q. For 2008, prices slipped by 4.7%. Data from the Urban Redevelopment Authority (URA) further exemplified a demand-led softening in residential property sales. Only 4,006 units were sold of 6,107 uncompleted units launched last year. In 2007, the take-up rate was 100% and 94% in 2006. As of December 2008, the total number of uncompleted units in the pipeline stood at 64,982, of which 43,414 were unsold. GELANG PATAH: SP Setia Bhd will open sales offices in Beijing and Dubai this year to promote its projects to international buyers. Chief executive officer Tan Sri Liew Kee Sin said the company already had sales offices in Ho Chin Minh City in Vietnam and Singapore. “We are not only selling our properties overseas but also helping to market Malaysia as an ideal destination for property buyers,’’ he told a press conference yesterday at the launch of Eco Greens, the Setia Eco Gardens town park, by Johor Mentri Besar Datuk Abdul Ghani. The 7.49ha park is part of the 383.64ha Setia Eco Gardens project currently undertaken by subsidiary Kesas Kenangan Sdn Bhd. The scheme is the first nature-inspired township in Johor and the company’s second eco-friendly project after the Setia Eco Park in Shah Alam. Taking about eight years to complete, the project comprises 10,000 to 20,000 mixed properties with a gross development value of RM2bil. Last year, Setia Eco Gardens won the FIABCI Malaysia Property Awards 2008 for Best Master Plan and its unique sales gallery also won the award for Best Office at the inaugural Cityscape Real Estate Awards 2008 held in Singapore. “Our products already reached an international standard and we are looking at selling our houses from RM1mil each to international buyers,’’ said Liew. He said the company was confident of attracting foreign buyers due to the quality products offered. Liew said these buyers had a choice of properties from the company’s on-going projects in the Klang Valley, Johor and Penang. SP Setia would also be looking for more land in Johor for future developments especially in Iskandar Malaysia, he said, adding that all its future projects in the country would incorporate the eco concept. KUALA LUMPUR: AmanahRaya-JMF Asset Management Sdn Bhd, which currently manages RM7.5bil in funds, is looking at going into Islamic real estate investment trusts (REITs) in the next two or three years, says managing director/chief executive officer Sharizad Jumaat. “We would like to go into Islamic REITs. What we can do is, we want to dilute it (the non-syariah components). As we get bigger, the size of the non-syariah (components) becomes smaller,” she told Bernama in an interview. Under syariah guidelines, the REIT can be considered syariah-compliant if the value of non-syariah components is less than 20%. Sharizad said currently, about 25% of AmanahRaya’s revenue from REITs were contributed by non-syariah components. ”If the market stabilises by end-2009 and we continue with acquisitions in 2010, we should be able to dilute (non-syariah components) by 2011,” she said. On the delay in the injection of new properties into AmanahRaya REIT, Sharizad said the company was taking a defensive approach to maximise the potential returns to unitholders. ”Until now, the property value is about RM645mil. With the third (property) injection, we can easily hit RM1bil,” she said. Sharizad said there were still opportunities available despite the current economic condition. “Our properties are not badly hit as countries like Britain, the United States, Singapore and Hong Kong where property values have dropped 20%-30%. Our market has declined by less than 5%,” she said.